3.00 p.m. on Wednesday, 23rd August 2017, at St Mary’s Parish Centre. This meeting will be to talk about what the group is doing, and to elect members of the group to be on the committee to help run the activities of the group. We will present our committee report on the year, and update on finances so far. for the yearly report by the FODI Chair, Felicity Livsey. 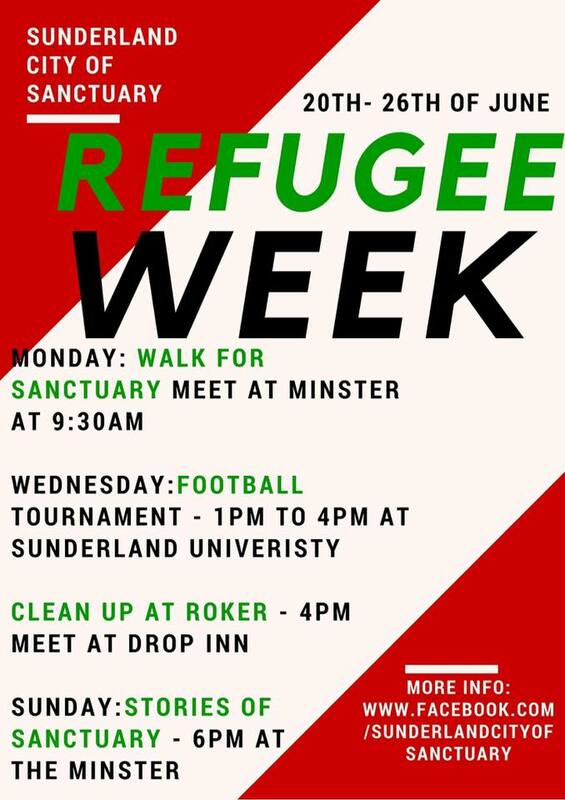 We have a whole host of events this refugee week in Sunderland and would love it if you join us for any of these activities. Friday June 23rd all day ‘FREE SWIM DAY’ – free swimming session for refugees at the AQUATIC CENTRE – drop in anytime. 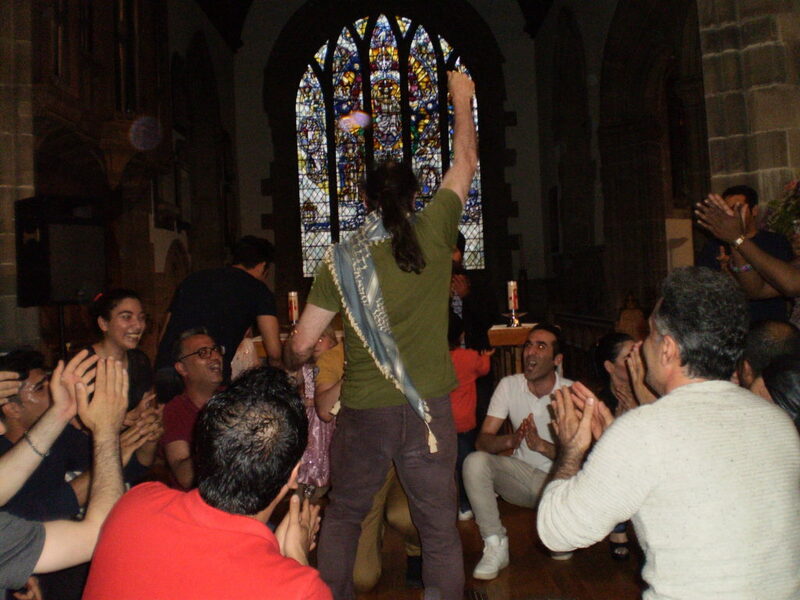 Tuesday June 27th 5.30 – 8.30pm ‘MULTICULTURAL CELEBRATION’ at BEDE TOWER, BURDON RD, SR2 7EA. Fashion Show, music, dancing and food plus activities for children. Do come and join us for this celebration of refugees in the community. All welcome but entrance will be by ticket. Please contact Sandra Watt at FODI or Ram and Shazana at Young Asian Voices on the details below. 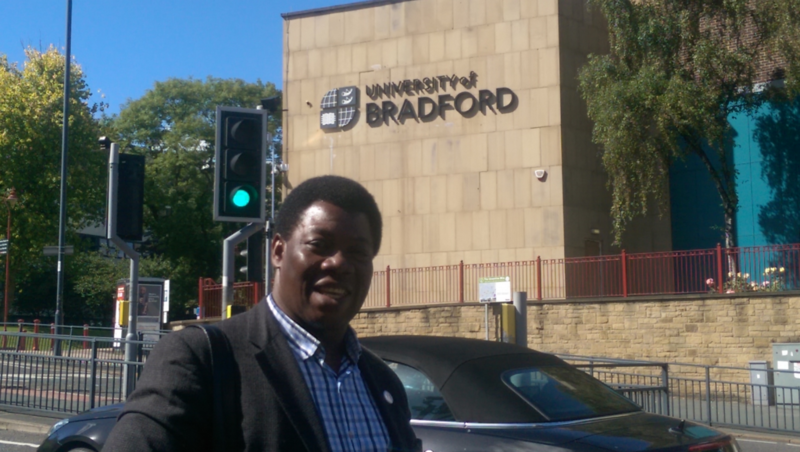 Everyone at FODI was delighted to learn that Abraham has been offered a scholarship to study Law at Bradford University, starting in September. 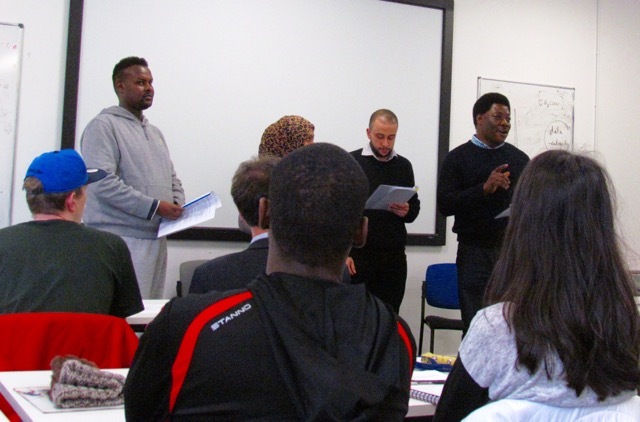 This Bradford University scholarship is part of a scheme under the Helena Kennedy Foundation , which gives asylum seekers opportunities to access higher education and pays the tuition fees and some travel expenses. Abraham also thanked people at FODI for their concern, encouragement and support and said that credit for this personal development also goes to everyone at FODI. 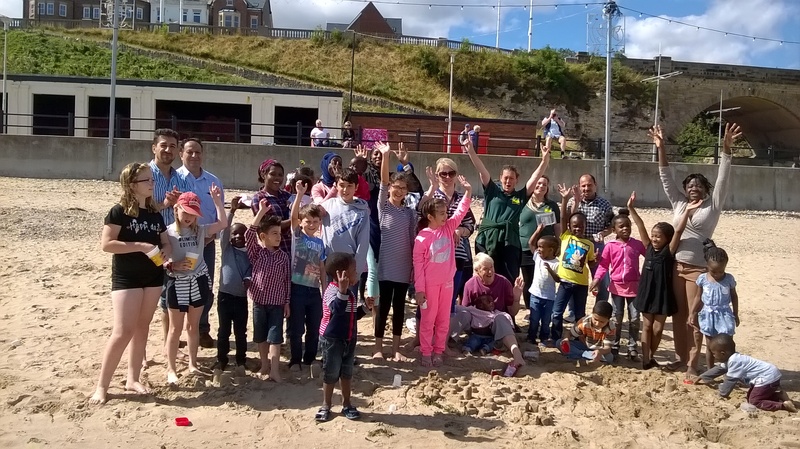 We have all spent six glorious Fridays throughout the summer on our collaboration with CEED in Roker park and on the beach – and what a time we had! We have all loved the range of activities, both children and adults alike: from monsters to minibeasts, from weeding to boatmaking and everyone who took part threw themselves into it. It was a great adventure using natural materials and the world around us, and although I cannot take personal credit for it – the sun shone down on us every week!! 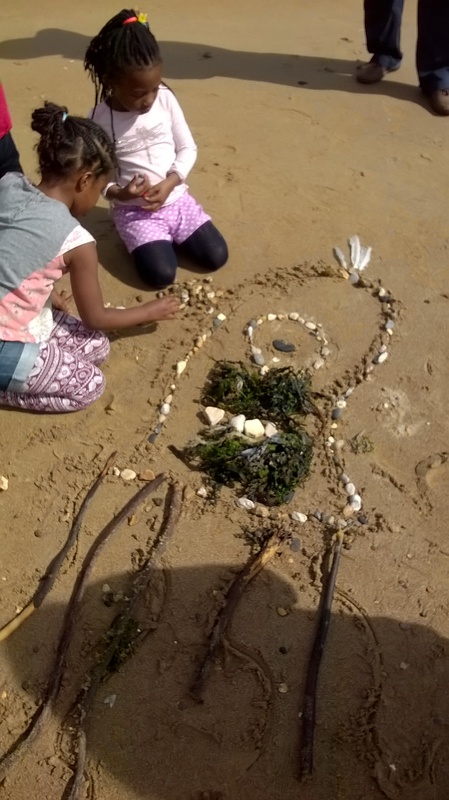 A huge thank you to all the children, parents, FODI volunteers , to Deb, Kaylee and Susan from CEED and especially to the Hilden Charitable Fund for making it all possible. 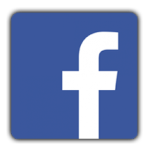 You can follow our weekly adventures on our facebook link. 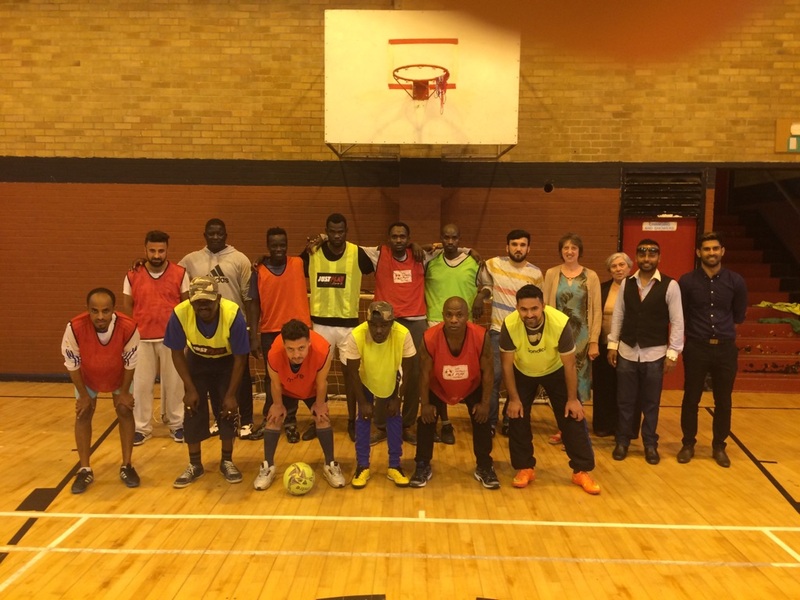 YOUNG ASIAN VOICES WRAPS UP ITS THIRD ROUND OF FOOTBALL SESSIONS AT THE END OF JUNE. The events this year were organised by Chris Howson and his team from Sunderland City of Sanctuary and there are photos and comments on the FODI Facebook page from FODI volunteer Amy about the Walk for Sanctuary and litter pick on Roker Avenue . 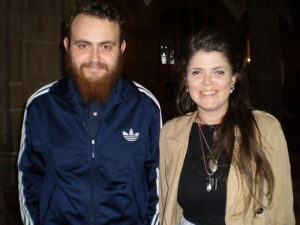 The theme of Refugee Week 2016 was ‘Welcome’ and FODI commissioned the following video filmed at the Drop- In and showcased at the Sunderland Minster event. Pav filmed and edited the video, with FODI volunteer Amy doing the interviewing of FODI members. A massive thanks to you both and to everyone who took part. Some photos from the Minster event, where we enjoyed food, entertainment and a fabulous photo exhibition commissioned by Crossings in Newcastle. 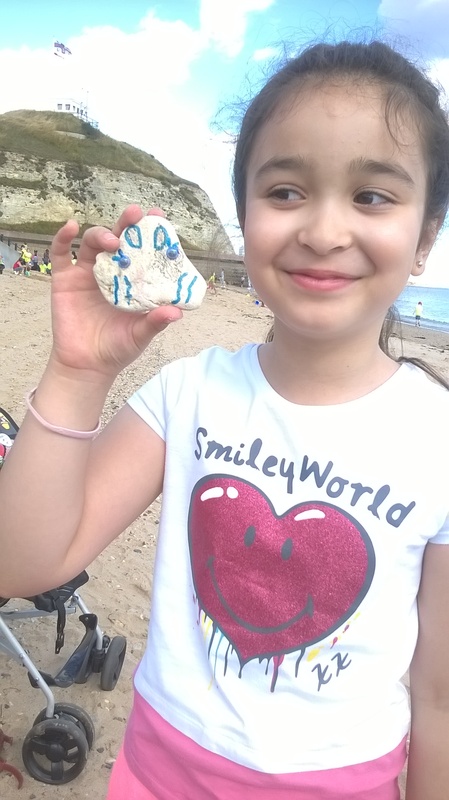 “Hello everyone my name is Rohullah, I am eleven years old and I am writing a diary about FODI, so today FODI took all the Asylum Seekers and refugees children and parents from Sunderland on a fun family trip to the Blue Reef aquarium at Tynemouth on a bus, so first of all we visited the whole place including tunnels and much more also there were lots of amazing fishes and I especially liked Nemo. After that we went to see a seal show and everybody enjoyed it. 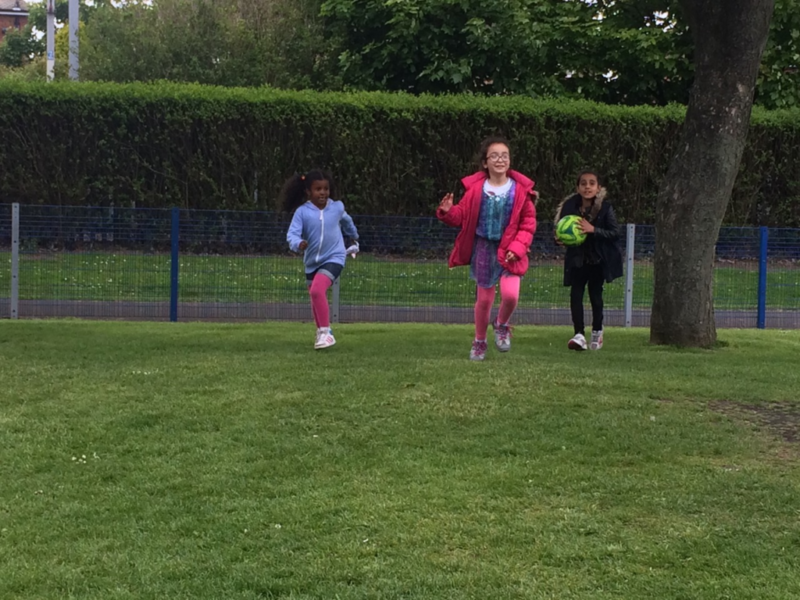 Then next we had lunch; when we finished we all went outside, I played a lot of football because I like it very much and everybody played some games and we all had a lot of fun, after that the ladies from FODI bought toys for every child. Then we went to the park and played for a while and when I was holding my shark balloon the wind blew it away and I was a little sad but thankfully all the kids including me got ice cream so it cheered me up! Finally, we all went home and it was a memorable and wonderful day, thanks Jane and her colleagues for organizing this tour! ‘Welcome’ , a sculpture by local artist Daisy Barnetson. This sculpture was created specifically for Sunderland Refugee Week 2016 and was on display in the yurt at Sunderland Minster during Refugee Week, June 21st-26th. Thanks to Daisy from all at FODI. We love it. 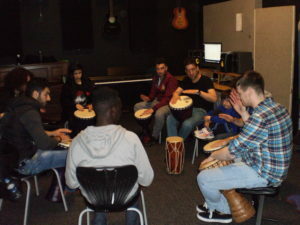 For the last six weeks FODI members have been taking part in drumming and guitar workshops at The Bunker organised by FODI volunteer Jane and Bunker staff member Ceiron Braddock, helped by apprentices Nathan, Annabelle, Anthony and James. We had great fun drumming and listening to music from different countries. FODI member Saros from Iran was over the moon when the Bunker staff gave him a guitar to practice at home. Thanks guys for your generosity. 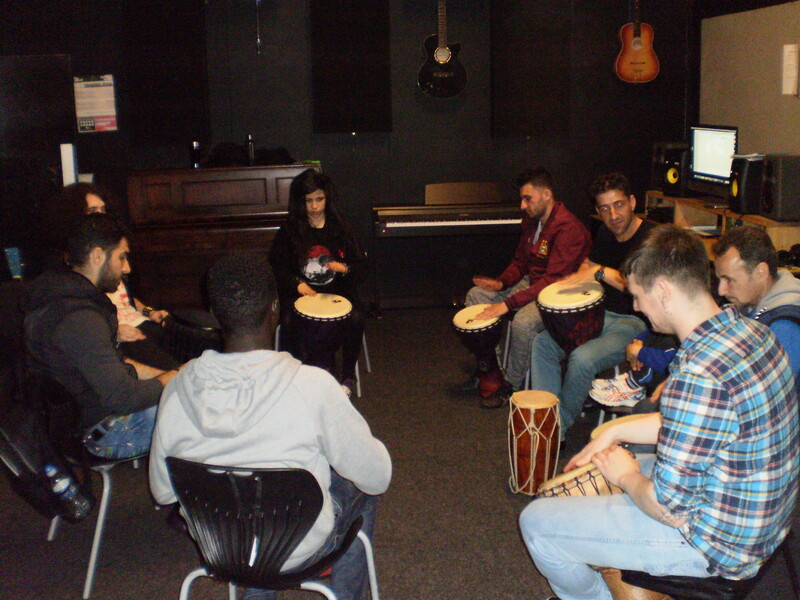 FODI members and Bunker staff will be drumming at the Stories of Sanctuary event at Sunderland Minster on Sunday June 26th from 6-8pm. Everyone is welcome to enjoy the event of music, stories, food and to make people seeking sanctuary feel welcome in Sunderland. Refugee Week is taking place from 20-26th of June and the theme this year is ‘Welcome’. The poster below shows events on in Sunderland during the week with more information on the City of Sanctuary Facebook page. 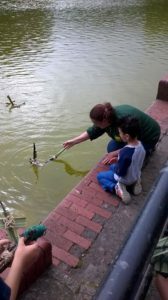 We have now completed the recruitment process for our new Project Development Worker. We had some very good candidates for our vacancy and our decision was very difficult, but we are very pleased that Mrs Sandra Watt will be joining us on 20th June. 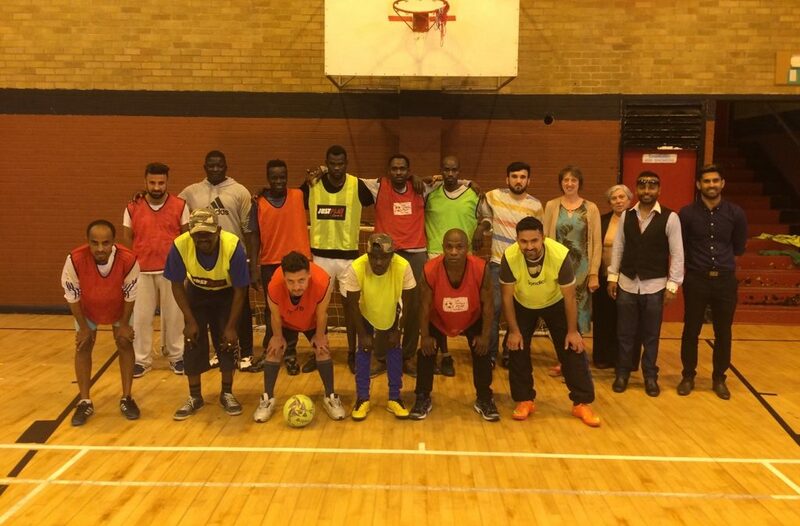 Sandra has considerable experience of working amongst asylum seekers and refugees, and will be attending the Drop-In regularly, so everyone will get to meet her. 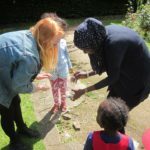 “We are really grateful and excited to have been granted this money, which will allow us to recruit a Project Development Worker who will help us to continue and expand our activities “. 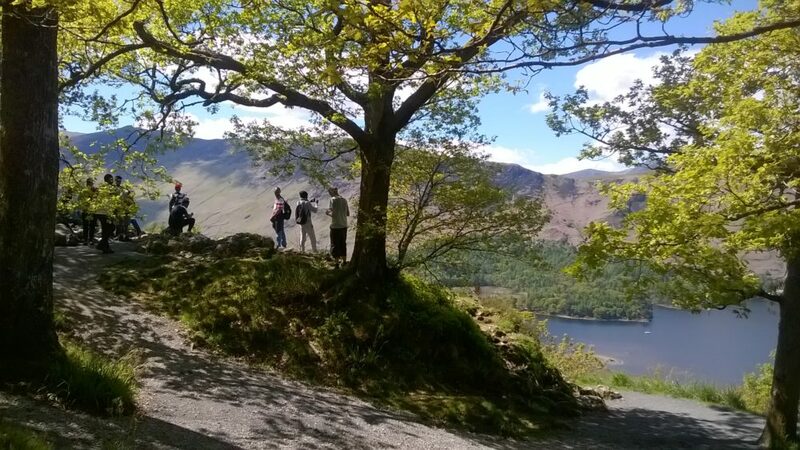 The job will be advertised on our website at the beginning of May, under our new ‘Vacancies’ heading. If you and your problem are able to get legal aid, Brar & Co can work for you. They can also work for you on non-legal aid matters, but you will have to pay the fee. They cover a wide range of issues, and can give advice and can work for people who cannot get legal aid (eg whose cases have been refused by other solicitors). 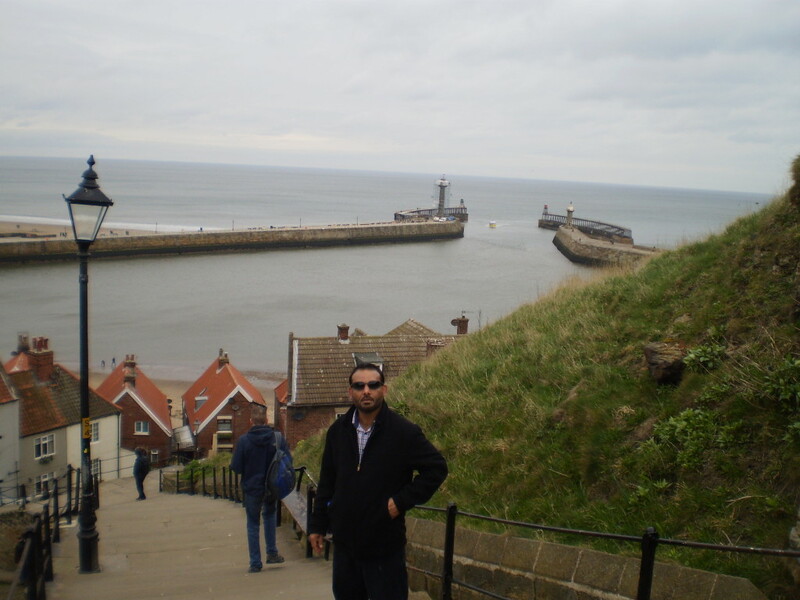 The day before Good Friday, FODI volunteers Jim and Jane took a group of FODI members on a coach trip to Whitby. 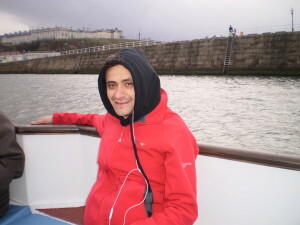 We passed through the beautiful North Yorkshire countryside and arrived in Whitby, where the weather was cold and windy. We stopped off at the local tourist information office and collected maps of Whitby, both as reminders of the day and for people to get their bearings. We climbed up the many steps to the Abbey with two of the guys helping Jane up the last 10 steps !! 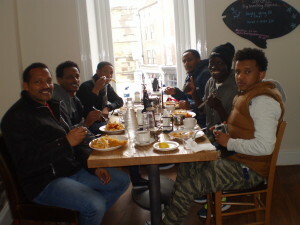 After returning to the town we enjoyed a meal of fish and chips and tea to warm us up. We walked along the harbour and took a short boat trip out to sea before returning to the coach. We had a great day despite the cold weather with the guys taking many photos to remind them of this picturesque town. ” It’s very interesting to do something you enjoy, last week I got an invitation from Jane to watch a movie in Empire Cinema. I was very happy because I like cinema. I went to the cinema with my friends and we met Jane there. she asked us to choose any movie we want. We chose The Finest Hour, after that we bought some crisps, popcorn and drinks, then we went to the screen ten. As soon as we took our sets the movie started. It was really cool dim lights, high sound and big screen. I felt like I was an actor in the movie. The film is taking about a coast guard makes a daring rescue attempt off the coast of Cape Cod after a pair of oil tankers are destroyed during a blizzard in 1915.The best thing in this movie that it is a real story. 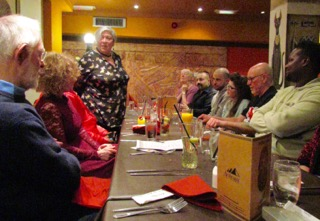 Dorothy our treasurer, organised a lovely night out at Arabesque on Tuesday February 16th. This was to thank the long standing FODI volunteers for their countless hours of dedicated work to support FODI. Without our volunteers, we would be unable to function. 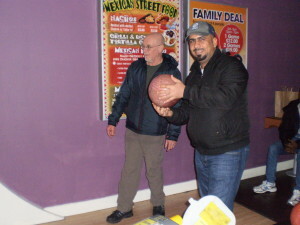 It also gave us a chance to have a chat and a catch up away from the busy atmosphere of the Drop- In. 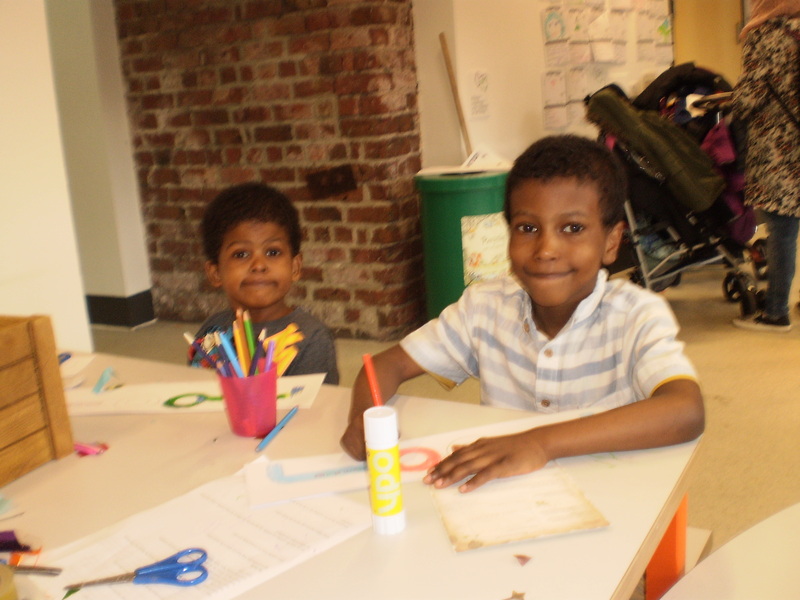 On Friday the 19th of February, 12 enthusiastic children aged 2 to 10 accompanied by their mums and FODI volunteers, Jane and Zeinab, enjoyed a great day at Seven Stories, the National Centre for Children’s Books in Newcastle. The centre is housed over seven floors, each floor is dedicated to the celebration of children’s books, bringing books and story-telling to life through exhibitions, lively events and play and where children are encouraged to explore books and storytelling and engage their imagination. At the start, the children immersed themselves in a spell of reading and exploring books in the Story Station whilst the younger ones discovered toys and the creativity of play. 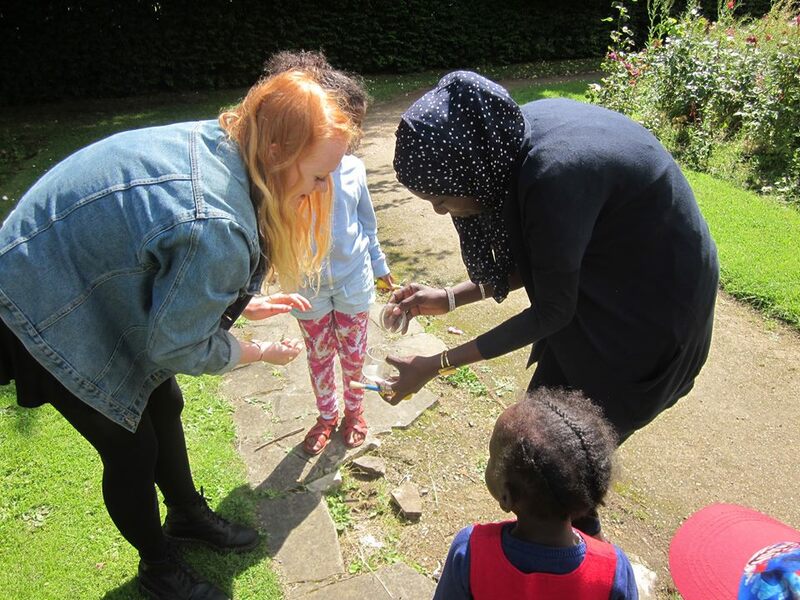 As the theme for the week was ” A Week of Wizarding Wonder”, the children were whisked off to create their own wands and Harry Potter glasses. 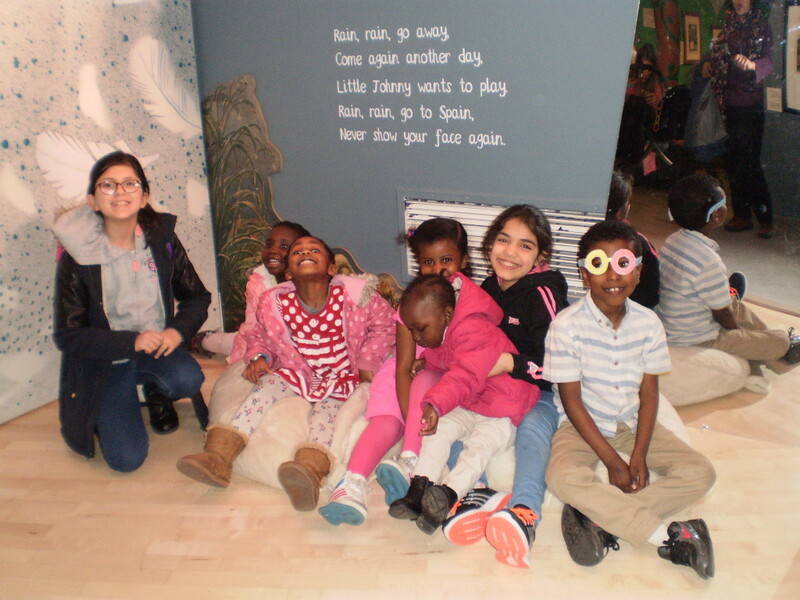 After a well-earned packed lunch, we all made our way to the Rhyme Around the World exhibition where the children could discover the magic of song and rhyme and dress up as various characters. As we hunted for the “Golden Snitch” around the centre, we came across the wonderful Harry Potter illustrations with a sprinkling of “Floo Powder” from the original artist Jim Kay and afew spiders to scare the adults. At 2pm, the sorceress read a fantastic book “What’s in the Witch’s Kitchen” in the learning space. With fun actions and rhymes all the children participated in the interactive story, including 3 year old Momadou who can’t speak any English. The grand finale was a trip to Diagon Alley a busy street bustling with witches and wizards hurrying in and out of shops. 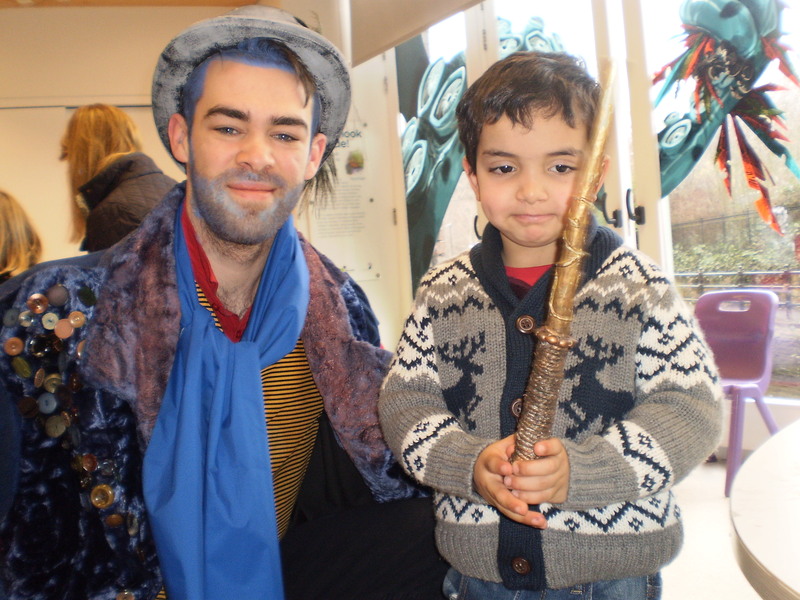 The children were treated to a lively show by the Northumbria University Drama students. 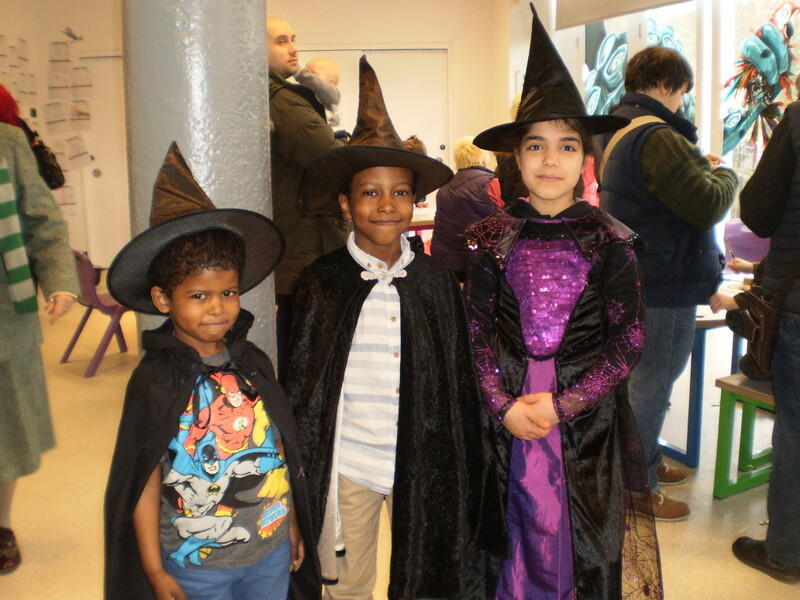 7 year old Tchui became a witch’s assistant, Amina, Nakour and Amani also played their part in the lively funny show. 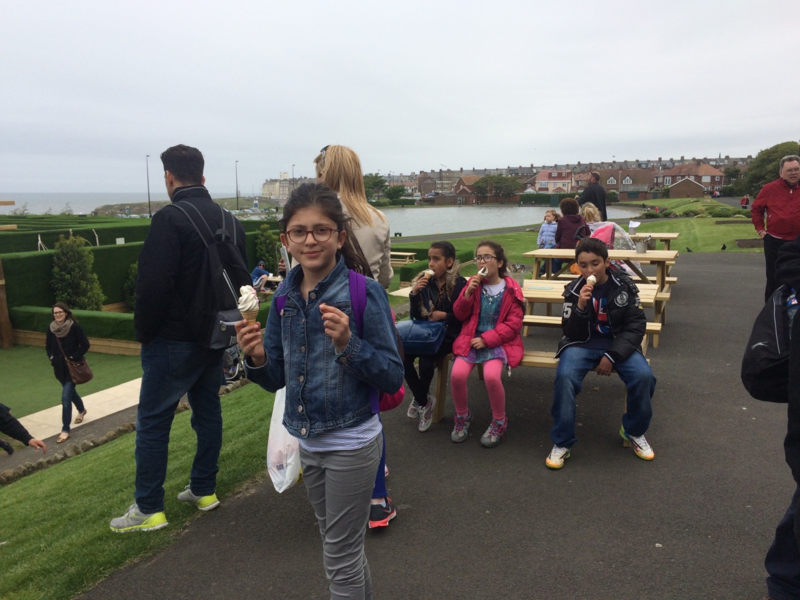 A great day was had by all and we returned tired but enriched by a wonderful experience. When asked by a staff member what she thought of the show, 5 year old Annette replied “magical”. In order to help FODI members get around Sunderland cheaply, FODI has in the past, distributed donated bikes to people on the bike waiting list. Due to overwhelming demand for bikes, FODI volunteer Jim suggested we run a scheme where we buy second hand bikes to give to people for a refundable deposit to cover the cost of bike locks etc. The FODI committee agreed to this scheme and allocated a small sum of money to it. 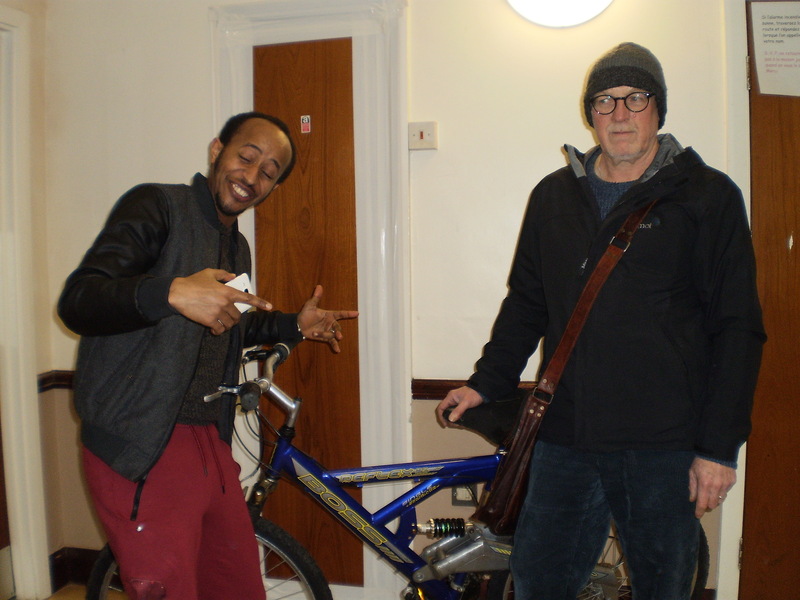 Jane and Jim sourced several bikes, which Jim checked over and gave out at the Drop- In yesterday to the first eight people on the waiting list, FODI member Habtom is delighted with his bike, as the photo shows. We still have 46 people on the waiting list !! Donations of bikes in reasonable condition are always welcome. See the contact page if you have a bike to donate. In order to help improve asylum seeker and refugee health , FODI has had since last year a health coordinator, Val Blackett and Ahmed Salah who is working on the ground within the asylum seeker and refugee community. 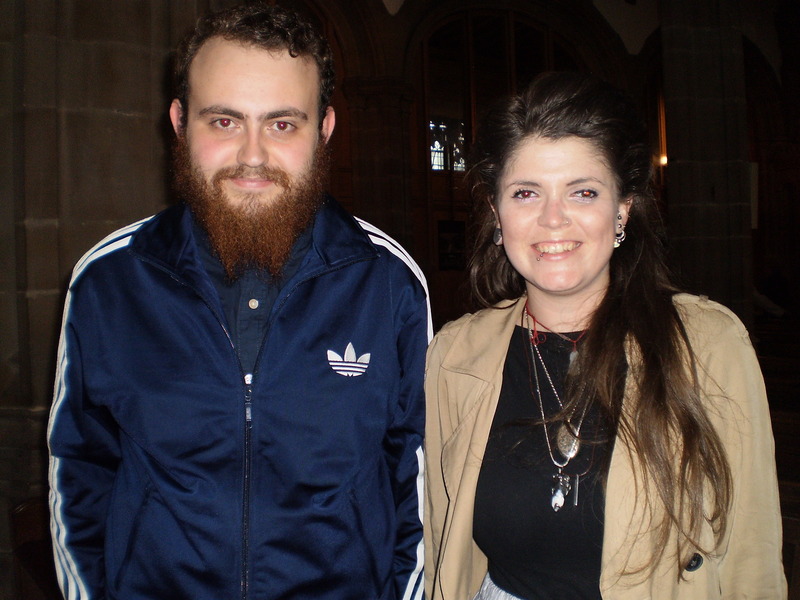 They are both FODI volunteers and have been working with Healthwatch and the Sunderland ‘Live Life Well’ team. 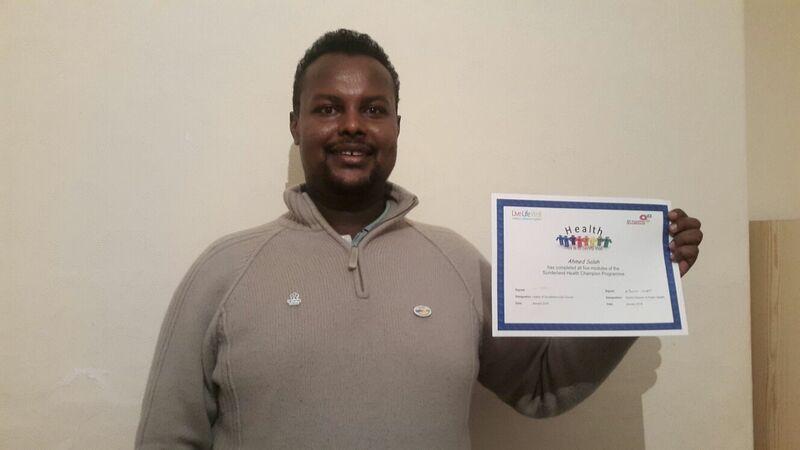 Ahmed completed all of the five core modules for the Health Champion training. He also sat the accredited level 2 exam ‘Understanding Health Improvement’, which he passed with flying colours. Ahmed is available at the Drop- In to help people with their health issues. Val , who is also a FODI volunteer, provides a regular Health update to the FODI committee, so we are aware of topics/issues being discussed at the meetings and we are very grateful for the work she is doing. Congratulations Ahmed from everyone at FODI on your fantastic achievements. We are really proud to have you as the first FODI Health Champion and know you will be able to make a difference in the asylum seeker and refugee community. 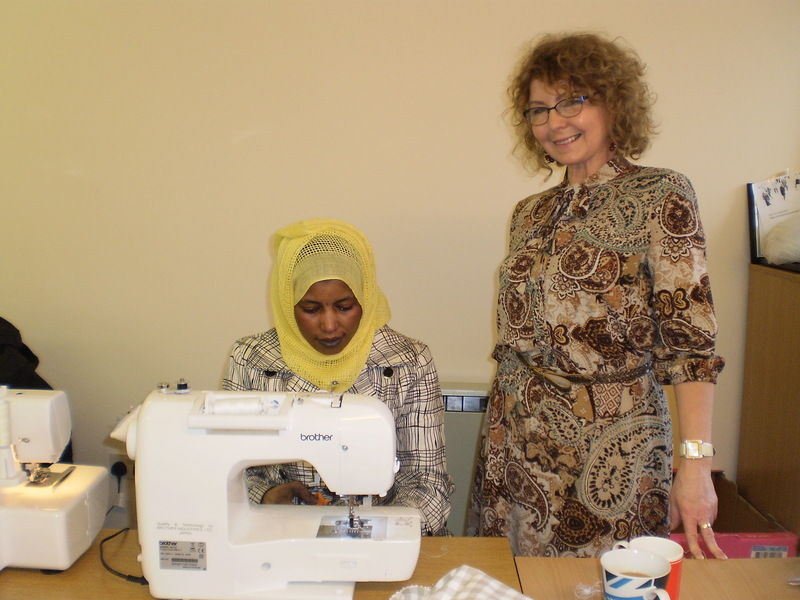 Dorothy Ismail, our treasurer, recently applied to the Northumbria Police Charities Fund for a donation of 3 sewing machines and an overlocker to be used by the FODI Womens’ Sewing group. The machines are now set up in the office and the women and their tutor Bernadette are delighted with them. They have made bags, aprons and cushion covers and are looking forward to their next project. 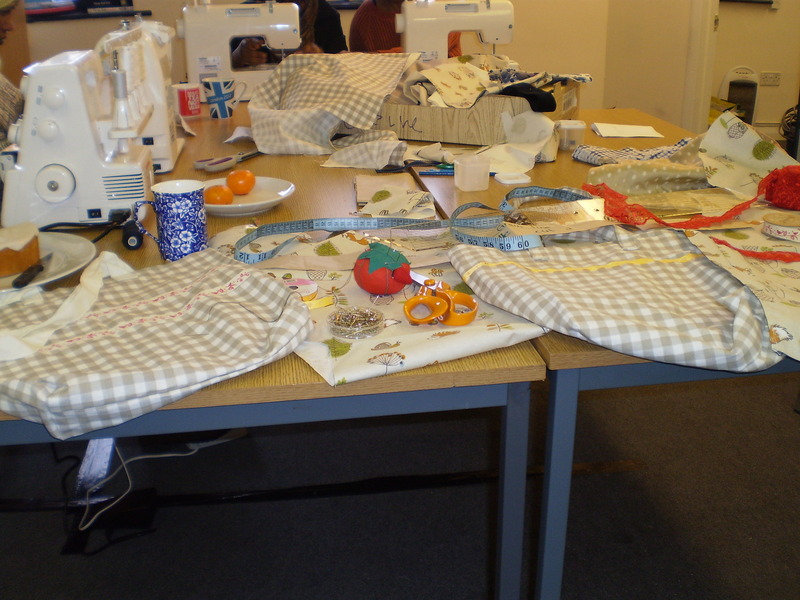 The group provides friendship, a chance to put the world to rights over coffee and cake and the opportunity to learn new sewing skills. FODI is very grateful to Northumbria police officers Paul Marshall, CEO Sunderland and Paul Andre, Police Charities Fund. 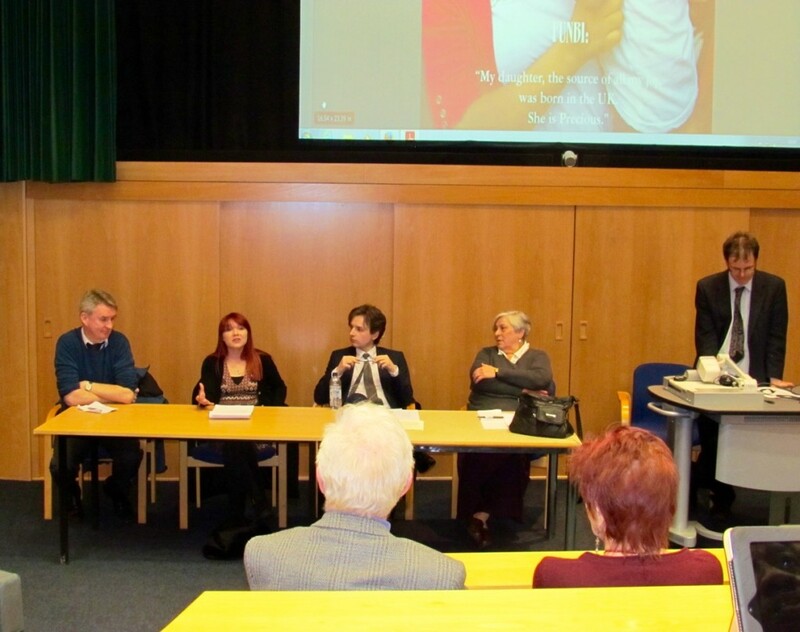 On 1st February an event “Refugees and Asylum Seekers: Experiences and Policy Options” took place at Sunderland University, organised by Dr Peter Hayes. 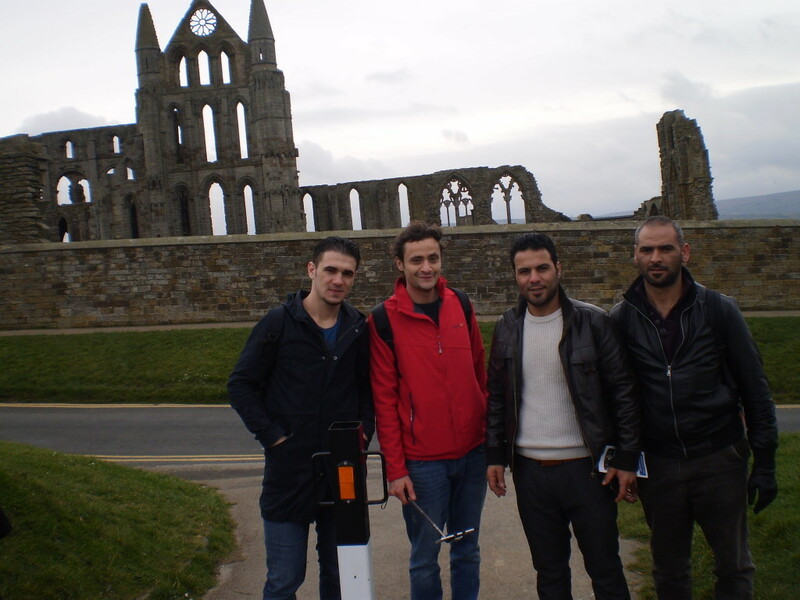 FODI members Salah , Ahmed and Abraham, with our friend Sara from Newcastle, took part in it. They gave a compelling dramatic presentation “Let go, feel human” which had been written by them together with Maggie. This explained asylum seekers’ reasons for coming and some of their experiences when they arrive here. Next was a question and answer session with the students, who had found the presentation both moving and informative. After this, Abraham and Sara showed slides of the “People like us” photos and text. 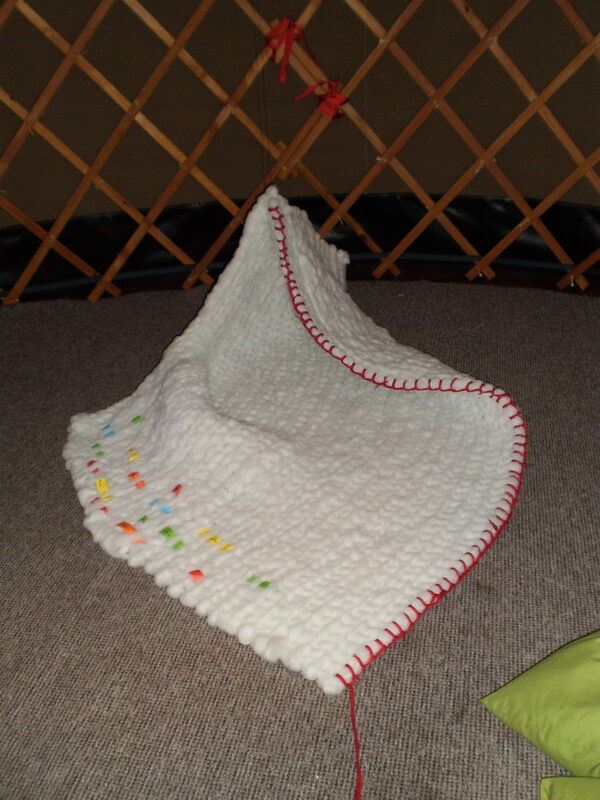 They and others had prepared these with a professional photographer and writer. 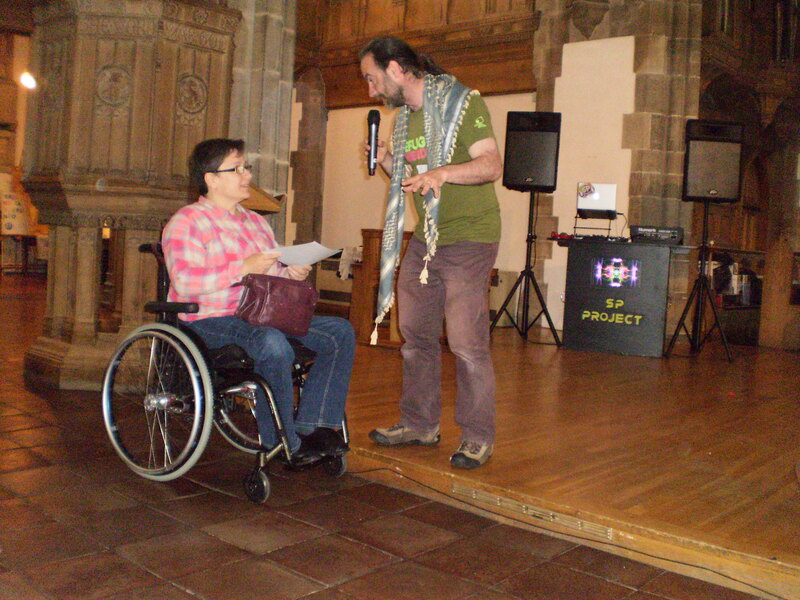 The project was organised by the charity Crossings. They are on display at the Discovery Museum , Newcastle until 12th February. The students were very interested in all of these sessions and discussions continued over coffee and lunch. 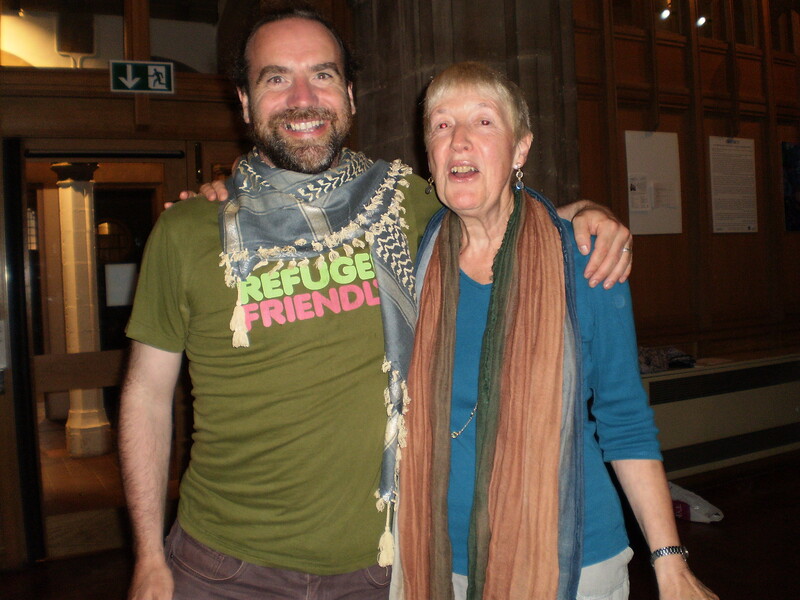 In the evening session Dorothy joined local politicians to answer questions about “Policy Options for Refugees and Asylum Seekers”. 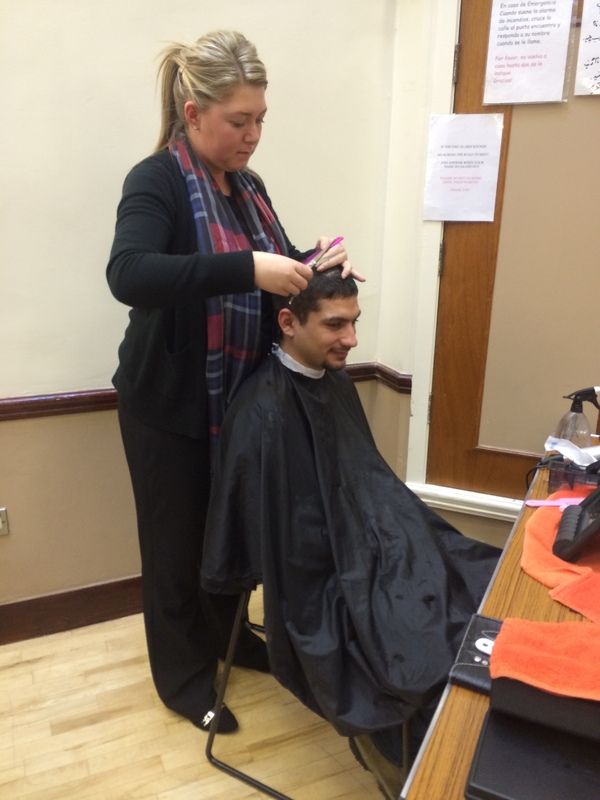 FODI members enjoyed free haircuts on Wednesday from Mark Sowerby’s excellent barbering team. 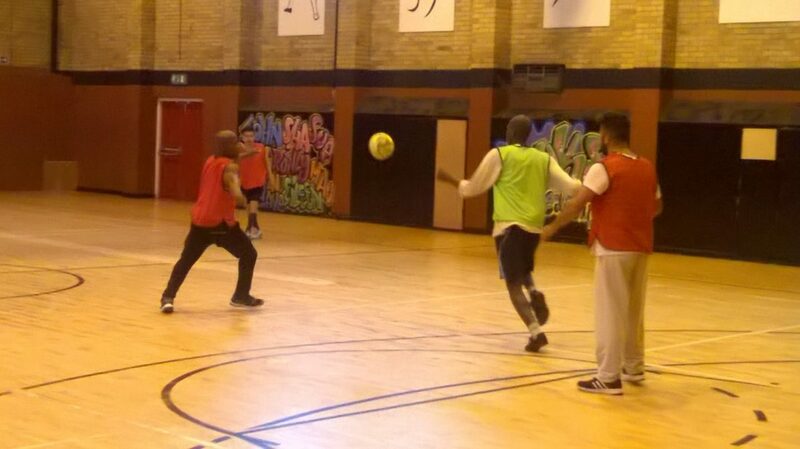 Every year the team visits the Drop- In regularly to practice its skills on our members. 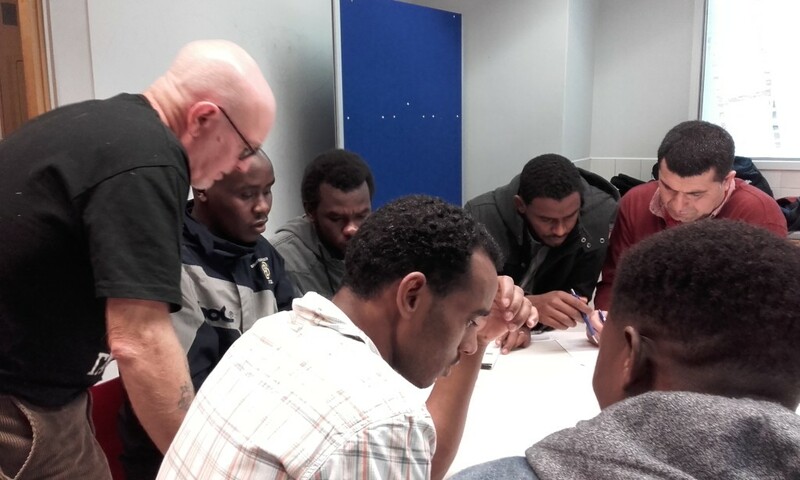 Before they come, Dorothy Ismail, our Treasurer, visits the barbering students at Hylton College to talk to them about asylum seekers and refugees. The talk is designed to help dispel some of the myths about seeking asylum and give the students an understanding of the people coming to the Drop- In. 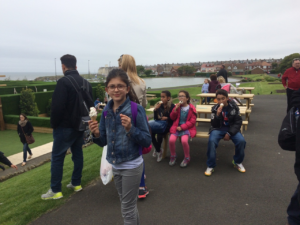 This year Dorothy was also accompanied by Yousef and Ammar, two asylum seekers from Syria, who spoke to the students about the terrible conflict in their home country. 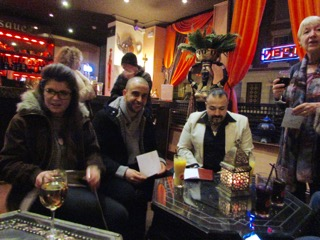 The photo below shows Yousef having his hair cut. 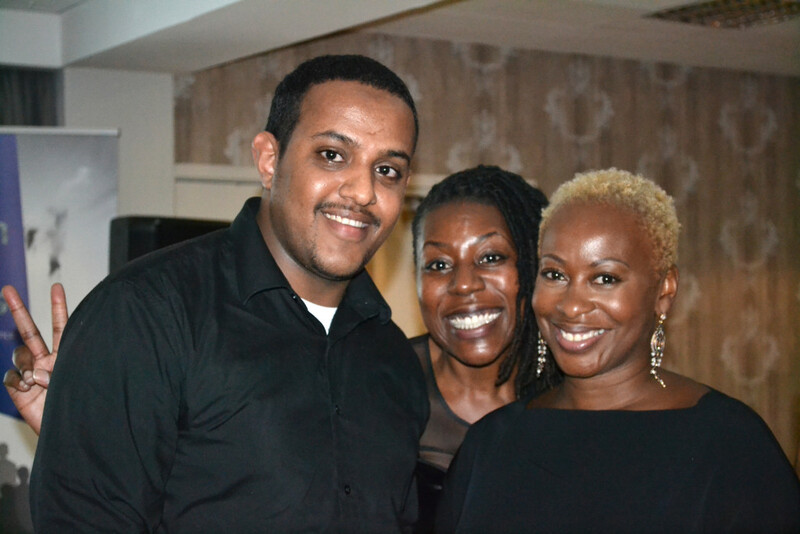 FODI sends thanks and best wishes to Mark and the team and we look forward to the next visit. The New Year brought much welcomed news to FODI from former member Semir, who moved to London in 2015 after getting his refugee status. He is working 20 hours as a Finance officer with YMCA England and is studying at evening class for an AAT Level 3 in accounting. 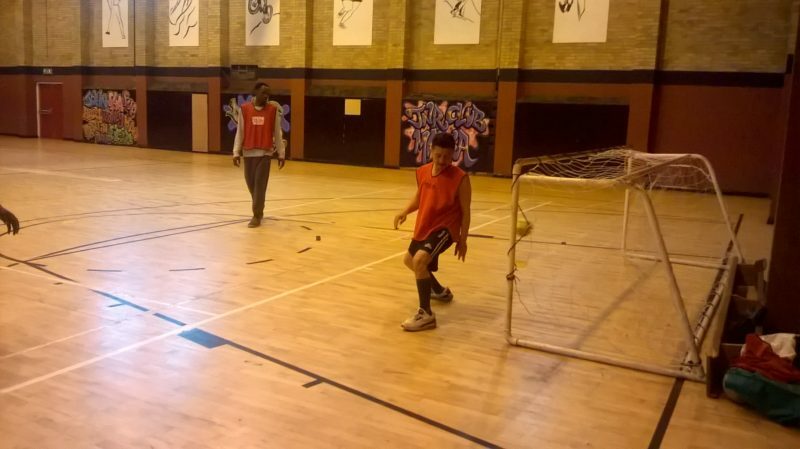 In December he got a special recognition award from the YMCA East London. He was also joined by his wife in December and is very happy. He thanked FODI for our full support while he was in Sunderland and wishes to show his wife Sunderland when the opportunity arises. 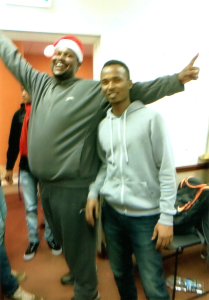 Congratulations Semir to everyone from FODI and good luck with your studies. 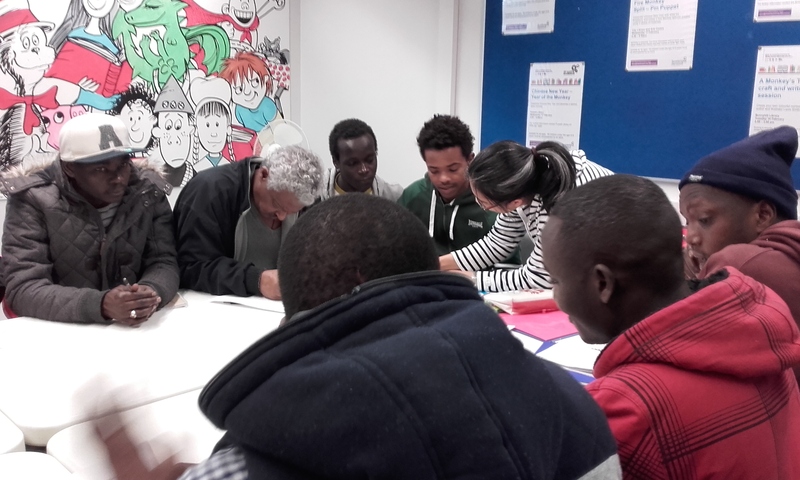 Jim’s free weekly English class for FODI members is held on Saturdays, from 11 am -1 pm at the Central Library on the second floor. FODI volunteer Jim is being helped by Yolanda and Jana as the class is busy, with up to 20 people attending. 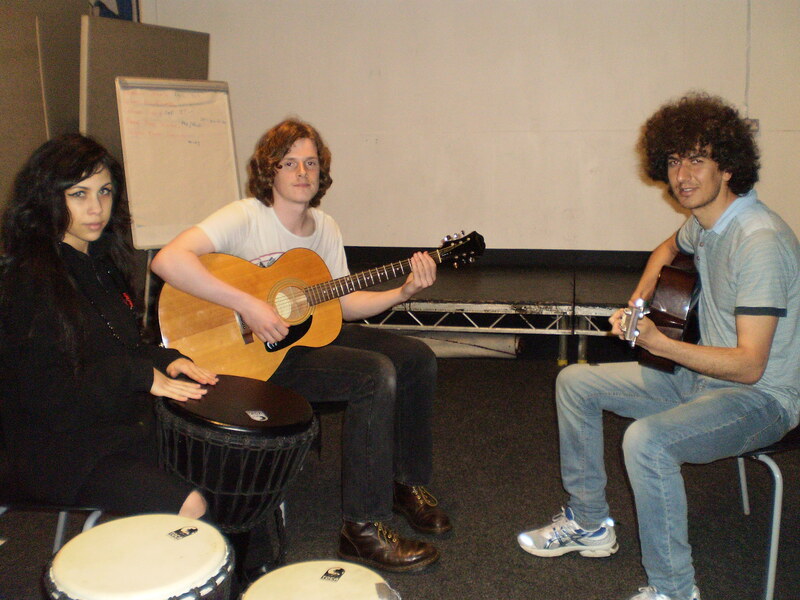 The learners often work in pairs, helping each other and are very enthusiastic. The teachers stress how important it is for the learners to be able to speak and read English for their future in the UK. 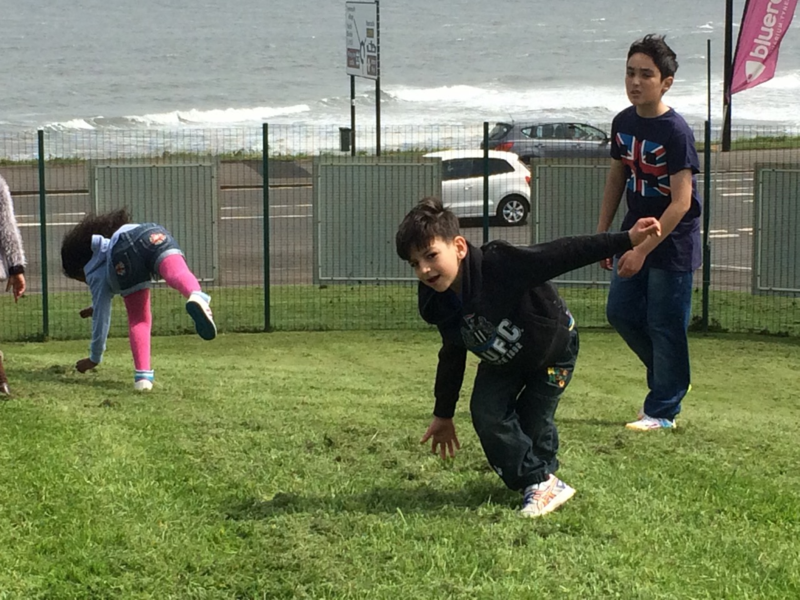 Welcome, warmth, peace, safety, other countries and cultures and Sunderland. 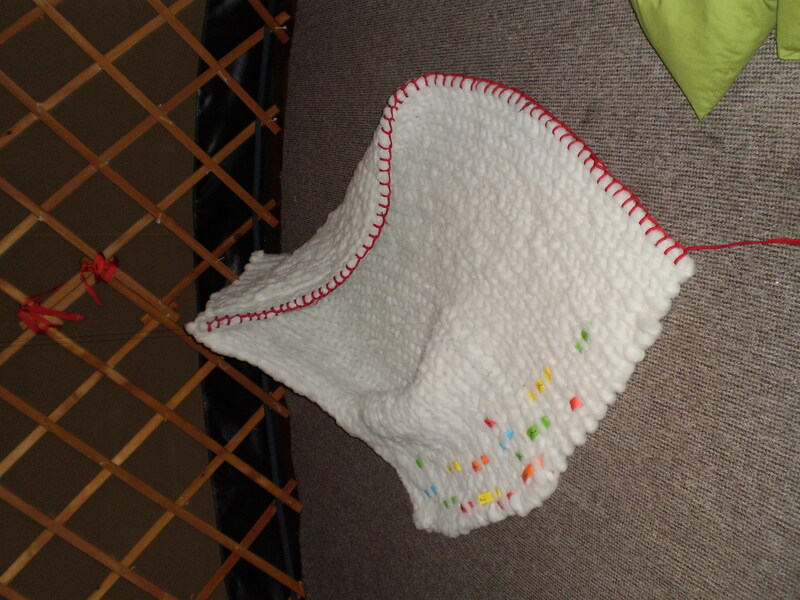 The final piece will be displayed on the FODI website when it is completed. 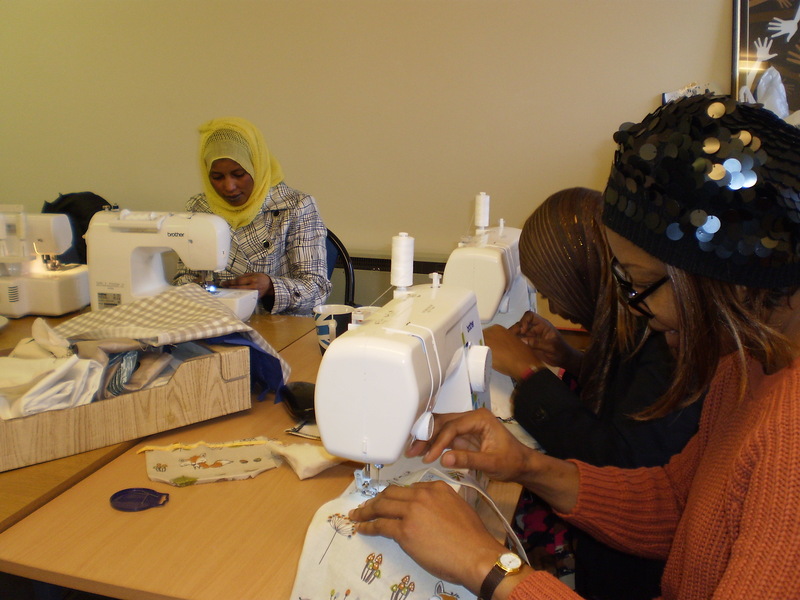 FODI Womens’ Sewing Group resumed on January 11th . 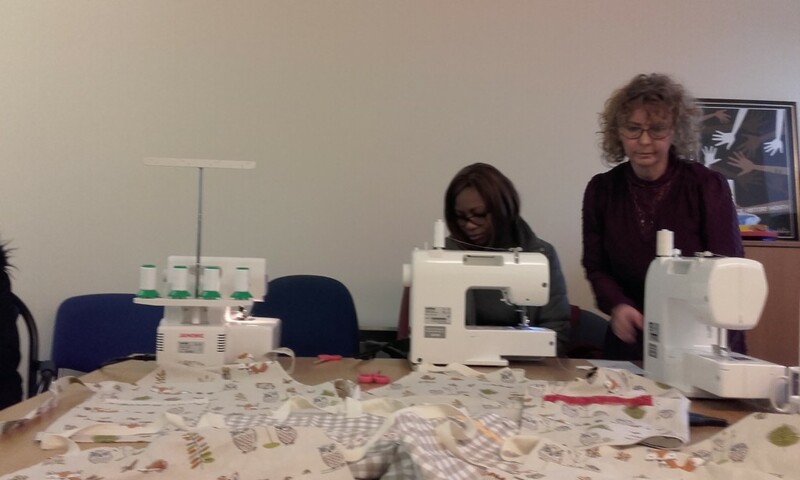 The women have made bags and aprons with a variety of colourful fabrics, assisted by Bernadette, who is a FODI volunteer an expert sewer. Refreshments are provided so the women can chat over coffee and cake. 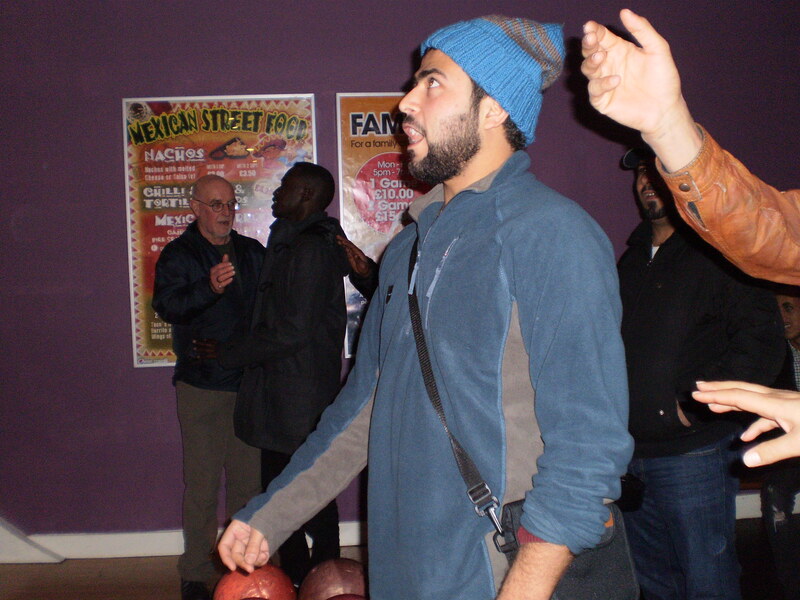 On December 30th, FODI volunteers Jim and Jane took a group of FODI members bowling in Sunderland. 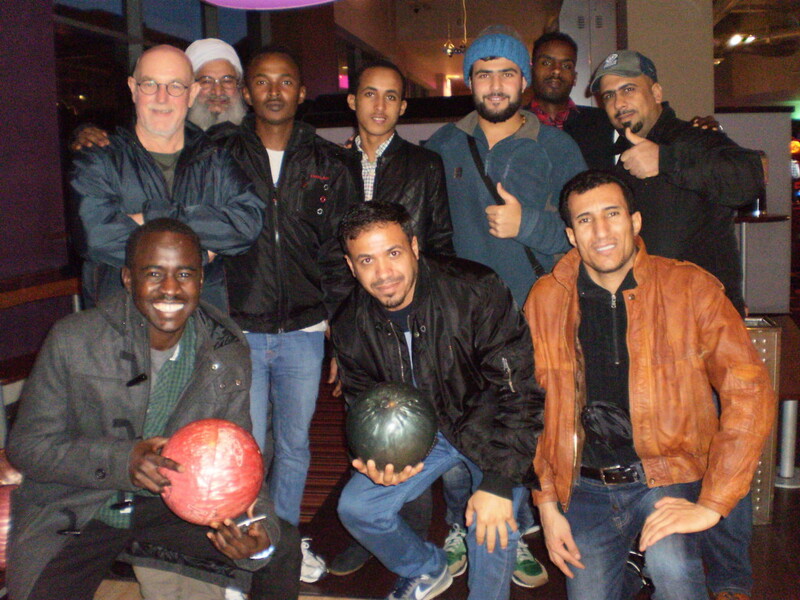 A great time was had by all and some of those new to bowling discovered they had a hidden talent for it.Another trip will be arranged in 2016. 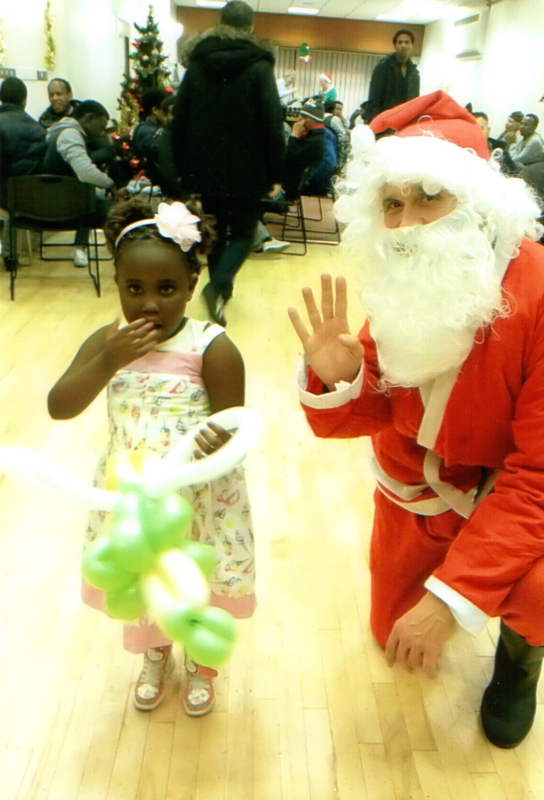 The annual FODI Christmas party was held at Saint Mary’s on December 16th and was attended by about 190 adults and children. Flash the balloon man did magic tricks and made fantastic balloon creations which delighted everyone. A tasty meal of curry, rice and onion bhajis was served by FODI volunteers to everyone attending. Santa Claus gave presents and a selection box to all the children and toiletry gift sets were given to the adults. The party went off smoothly due to the excellent planning of FODI volunteer Felicity and her team and everyone said they enjoyed it. 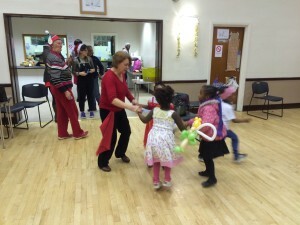 Thanks to our funders and all the people who gave donations to help with the party.